Potential buyers commonly adopt one or more valuation methodologies, such as the EBITDA multiple (earnings before interest, taxes, depreciation and amortization), EBIT multiple (earnings before interest and taxes) and discounted cash flow. An important distinction must be made between the value of the business (referred to as its “enterprise value”) and the value of the equity in the business. The equity value is the result of the enterprise value less the financial liabilities. The value of the business is independent of the underlying form of financing. Multiples are typically applied to the classic profit measures, such as EBITDA or EBIT. The historical figures have to be normalized first before they are multiplied with a multiple of a comparable company. The resulting value is the enterprise value. How does the multiple methodology work? The normalization reflects the adjustment of the historical figures to sustainable cash flows that a potential buyer believes the business will generate each year in the future. Examples of such adjustments are corrections of extraordinary or singular income or spending. The normalization should be prepared by the seller and their advisors since the buyer might not recognize certain adjustments or only implement adjustments in their favor. There are numerous factors that can influence the valuation multiple in any fact-specific situation. Valuation multiples reflect the buyer’s expectations as to the future cash flow of the business given its risk profile and growth prospects. 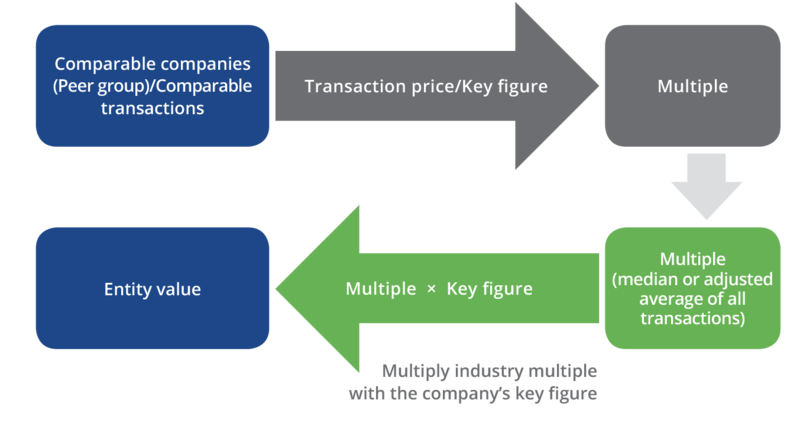 Valuation multiples can vary widely, even among companies within the same industry. As a general rule, larger, more established companies tend to fetch higher valuation multiples than smaller companies. The potential buyer will base the price they are willing to pay on their valuation calculations. By doing so, they can value the business on a standalone basis so that it will continue as before. However, they are also very likely to make a valuation which takes into consideration the value of the business under their leadership and with some synergies. The potential buyer will, therefore, only be willing to pay this generally higher price if there is a competitive situation, which tends to cause offers to increase. A competitive situation is therefore crucial in obtaining the highest possible purchase price. This is one of the key functions of an M&A advisor.